Make it smaller and have something better?! It works for electronics – but could it work for swimming pools, too? Just imagine owning a smaller, more economic swimming pool – that’s right, for real swimming workouts – packed with functionality, ready for anything: spa experience, aquatic exercise and gorgeous to look at right there at the back of your house. What exactly is a spool or cocktail pool? How to Put the Spa into the Spool? Complete Fibreglass Spool or Bespoke Solution? Forget ‘exactly’. When it comes to truly great overall design you will hardly find a spool off the shelf. Instead, it is usually a bespoke solution to difficult and contradicting requirements. A gorgeous, inviting pool BUT there isn’t much space. A private pool to exercise in BUT not enough space for a lap pool. A swimming pool and a spa and a lovely place to entertain guests BUT the backyard is tiny. Want all of the above BUT worried about upkeep and maintenance. 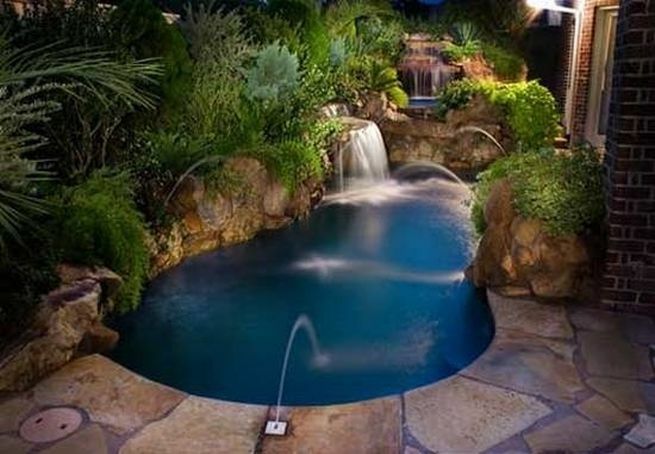 Believe it or not, with advanced technology and the know-how of a good pool builder these dreams can come true. And they don’t necessarily have to be outrageously more expensive than a typical swimming pool. A spool is somewhat larger than a spa tub but not quite reaching the size of an average residential pool. So, usually somewhere around 13’x13’. On the face of it that’s just enough to stretch out and soak in and take a bit of gravity off your body and hardly seems worth the effort. However, a spool of that size could also easily become a restful people magnet and luxurious background for entertaining and adds a touch of harmonious well-being. Can it get any better than that? Oh, yes! You could have the enticing and relaxing benefits of a well-designed spa and a place to do real workouts, and not just swimming but running or cycling and of course aquatic exercise, too! 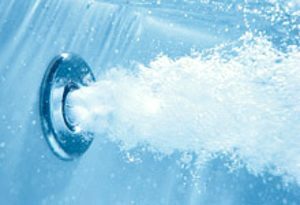 Spa jets – Pure Heaven! The type of jets has a direct impact on how much relaxation and enjoyment you get out of a spa and most of them can just as easily be installed in a spool. Water with its resistance, buoyancy and cooling effect offers a unique environment where everybody regardless of age and fitness level can safely improve their strength and stamina. Moving in water has proven to be so beneficial, no wonder there are now a number of solutions available to tone and condition your body while in the pool. People who would not be comfortable running or exercising on land often find water to be their best friend to get into an enjoyable and effective routine without putting strain on their body. But not everybody has access to a larger pool to swim full lengths or attend aqua classes. There are several possibilities to turn your small pool into a home gym. This is like a tread-mill for swimming. A strong, adjustable current allows you to swim on the spot. You could swim a marathon without leaving your backyard. How cool is that? There are a number of ready-made options where the whole swim spa comes with all jet systems built-in, for inground as well as above-ground installations. Or, a swim jet can be installed into an existing or a custom pool. Either way, these can be quite pricey solutions. If a swim spa is above your budget, you could still swim in a small pool by putting yourself on a leash, sorry tether. It’s low-tech and does the job of keeping you on the spot while your arms and legs work against the water. Originally used in rehabilitation and therapy water treadmills offer great benefits to everyone wanting to get an efficient workout, especially, but not only for people suffering from aching joints, recovering from surgery, as part of a weight-loss exercise regime or to spice up your normal running routine. The buoyancy of the water minimizes the impact of each step on your joints. In addition, the water has a soothing and cooling effect. In very deep water body weight is somewhere around just 20% of what it’s on land, eliminating the impact of steps. 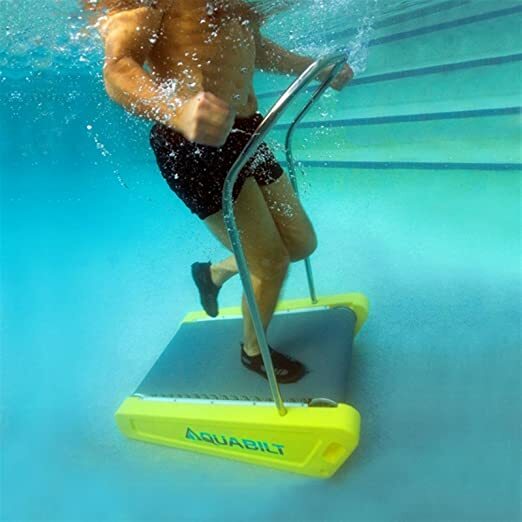 Aquajogging gives joints and ligaments the freedom to move pain and injury free. A spool is unlikely to be deep enough for deep, deep water running, though. A portable treadmill placed in about chest deep water is a very good alternative designed to be taken in and out of the water when needed. Endlesspools and Swimex are leading companies offering fully built-in treadmills. An Aquabike allows cycling in water on a stationary bike. Moving your legs in water in a rotating motion can be a gentle form of exercise or a pretty hard workout. Aquabikes need of course be built for pool use and ideally be easy to lower into and retrieve from the spool. The simplest way to turn your spool into a gym is by using Aqua weights. Simple foam dumbbells can be a surprisingly effective means to shape and tone your muscles. Unlike dumbbells made for land exercises power is needed when pushing against the water, so usually downwards or sideways. Well, depends on what you are comparing! A spool, especially one with extra features is not necessarily much cheaper to build. Where it scores better is in care and maintenance cost. A bigger pool requires practically daily vacuuming and monitoring of chemical levels at high season. Its large surface will naturally collect more debris and dust and allow more water to evaporate which needs to be replaced. Also, the more water in the pool the more the pool pump has to work, meaning either the pool pump has to work longer or a stronger pump system has to be installed causing higher initial cost and energy consumption per pump hour. 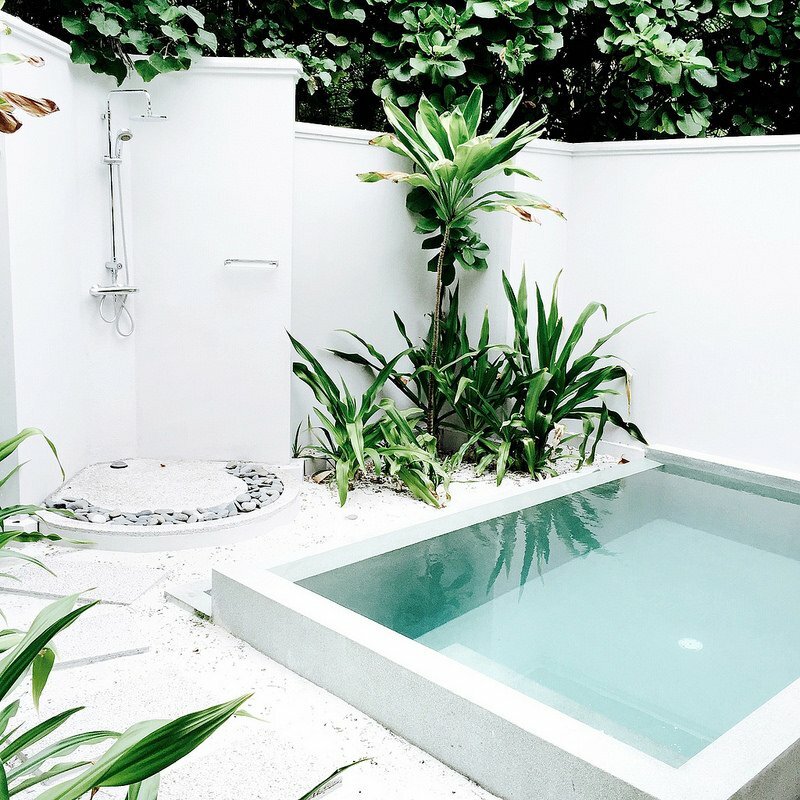 So, reducing the size of the pool means lower energy and water bills, less pump time and, quite frankly, overall less hassle to keep everything pristine and inviting. A number of companies offer ready-made complete spa and exercise pools. These pools are clearly designed for functionality and you can be sure that jets, pumps and heating systems work really well and as advertised. However, for a more individual look and feel and if you would like your pool to be seamlessly integrated into the yard a local pool builder will be your best choice. I was just about to ask where I could get one from, and saw your link in the comment above! I love the treadmill! Where can you buy those? I know, it’s great isn’t it. The one shown here is the Aquabilt A-2000 Excercise Swimming Pool Treadmill It has received great customer reviews on Amazon.